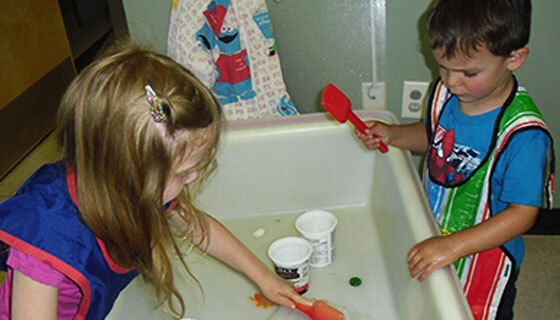 The Child Development Centre is proud to provide the community of Fort St. John with a fully integrated preschool program that specializes in serving children ages 3-5 with both typical and special needs. Social Emotional: to help children develop independence, self confidence and self control, follow rules and routines, make friends and learn what it means to be part of the group/community. Physical: to increase children’s large muscle skills, balancing, running, jumping, throwing and catching and use the small muscles in their hands to do tasks like buttoning, stringing beads, cutting, drawing and writing. Cognitive: to acquire thinking skills such as the ability to solve problems, to ask questions, and to think logically, sorting, classifying, comparing, counting and making patterns and to use materials and their imagination to show what they have learned. Language: to use words to communicate with others, listen to and participate in conversations with others, understand the purpose of print, recognize letters and words and begin writing for a purpose.